Buffalo – July 4, 2014: TOPS Markets has installed multiple impulseGUIDE digital signage systems to better serve patrons. The Café is utilizing a seven screen display system to present prepared food options, specialties, featured products and specials. This generates an increase in revenue and allows for perceived waiting times to be reduced. 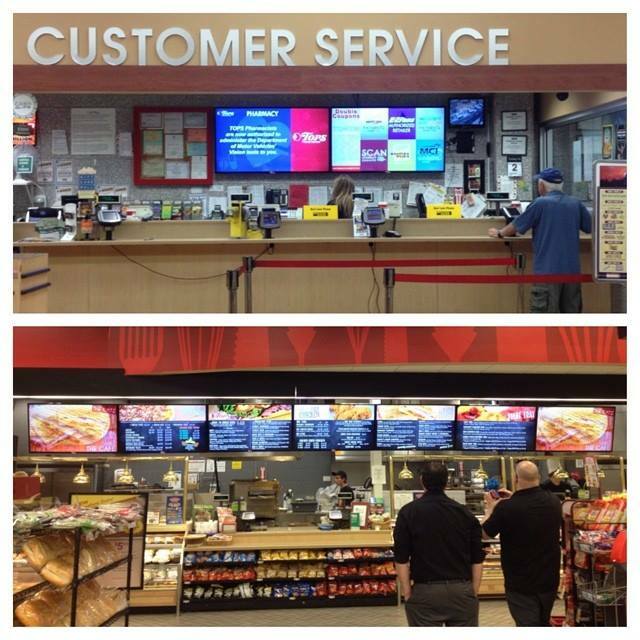 The customer service desk has also had a two screen display system implemented to educate patrons about all of the services they provide and display weekly store promotions. The head of each department is given administrative rights to manage and customize content. These fully configured and customized systems draw on the impulseGUIDE patent pending approach of keeping content fresh, up to date and dynamically interesting. Trivia and multiple choice product infotainment add to the appeal of the brand and promotional messaging. New approaches to product photography have been used as well. “Poor product photography can really hurt sales” said Frank C. Pusateri, CEO/Creative Director of impulseGUIDE. “We have used some highly productive approaches to image capture and even more to maximize the use of the image library for sales”. Pusateri continued, “TOPS Markets has a compelling vision of how they want to use place-based media in the grocery retail environment. Our software and unique approach will continue to serve their business goals as they further develop and refine how revenue, profitability and patron engagement goals are met”.